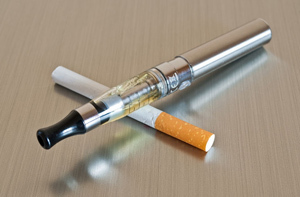 Some teens who use e-cigarettes and other non-cigarette tobacco products report smoking cigarettes one year later, according to recent research funded by institutes within the National Institutes of Health and the Food and Drug Administration. The research is based on data from the participants of the nationally representative Population Assessment of Tobacco and Health (PATH) study. The researchers studied cigarette-smoking initiation among more than 10,000 participants in the PATH study. When first interviewed at ages 12-17, roughly half of the group reported that they had used e-cigs, hookah, snuff, or other non-cigarette tobacco products, but never cigarettes; the rest said they had always been completely tobacco-free. When re-interviewed one year later, 4.6 percent of the group reported that they had now smoked a cigarette. Adjusted for other smoking risk factors, those who initially reported having used a non-cigarette tobacco product were twice as likely to have smoked cigarettes during the past 30 days, and those who had used more than one type of product were nearly four times as likely. For a copy of the abstract, go to "Association of Noncigarette Tobacco Product Use With Future Cigarette Smoking Among Youth in the Population Assessment of Tobacco and Health (PATH) Study, 2013-2015" published in JAMA Pediatrics. For more information about Tobacco/Nicotine and E-Cigs, go to https://www.drugabuse.gov/drugs-abuse/tobacconicotine-e-cigs. NIDA. "Study shows association between non-cigarette tobacco product use and future cigarette smoking among teens." National Institute on Drug Abuse, 2 Jan. 2018, https://www.drugabuse.gov/news-events/news-releases/2018/01/study-shows-association-between-non-cigarette-tobacco-product-use-future-cigarette-smoking-among. NIDA. Study shows association between non-cigarette tobacco product use and future cigarette smoking among teens. National Institute on Drug Abuse website. https://www.drugabuse.gov/news-events/news-releases/2018/01/study-shows-association-between-non-cigarette-tobacco-product-use-future-cigarette-smoking-among. January 2, 2018.